In the first quarter of 2017, the volume of Ukrainian exports of goods and services totaled $ 12.4 billion, which is $ 2 billion, or 28%, more than in 2016. 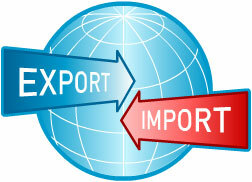 This is stated in the message of the Ministry of Economic Development and Trade of Ukraine. As a result of the quarter, exports of goods amounted to $ 10.4 billion (an increase of $ 2.7 billion, or 34.4% over the same period in 2016). In the structure of exports of goods, the largest share was made of products of the agro-industrial complex and food industry (44%), metallurgical products (23.4%), machine building (10.4%) and mineral products (9.2%). The growth of export of goods for the reporting period was provided due to the growth in exports: iron ore and concentrates (by $ 331.9 million), sunflower oil (by $ 315.7 million), soybeans (by $ 225.9 million), flat-rolled flat $ 190 million), corn ($ 140.4 million), semi-finished products of steel ($ 125.2 million), sugar ($ 116.3 million), wheat ($ 110.6 million), ferroalloys ($ 100.7 million) and Barley (by $ 65.8 million). The main trading partner of Ukraine in the export of goods in the first quarter of 2017 is the European Union (38.4% share, while the growth in relation to the results of the same period last year was 24.5%, or $ 782.3 million, at the same time The share of Russia was 9%. The export of services in the first quarter of 2017 relative to last year’s period increased by 7%, or $ 156.3 million, and amounted to $ 2.4 billion. In the structure of services exports, the largest share was made up of transport services (55.4%), computer and information services (16.3%), services for processing material resources (13.9%) and business services (7.7%). The growth in export of services was provided due to an increase in the volume of provision of services for the processing of material resources (by 36.4% or $ 89.3 million), tourism (by 8.8%, or $ 4.2 million), transportation (by 8, 7%, or $ 107.1 million), repair and maintenance (5.6%, or $ 2.7 million) and business (1.8%, or $ 3.3 million).